In support of the company’s broader Corporate Social Responsibility (CSR) platform focused on family health and wellness, Kohl’s announced it will donate $5 million, over four years, to Children’s Hospital of Wisconsin to help launch a multi-year mental health strategy to improve mental health services for Wisconsin kids and their families. 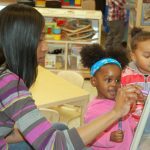 Kohl’s will award a $1.5 million grant to Discovery World, over three years, to increase access to science, technology, engineering, and math (STEM) education for children and families in Milwaukee’s most vulnerable communities through Kohl’s Design It!, a hands-on, educational program that encourages students and families to use technology to turn imagination into reality. Today, Kohl’s associates delivered and sorted more than 750 presents, that were donated by Kohl’s associates, to gift to the nearly 1,000 children and families served by Penfield Children’s Center at its annual holiday party on Saturday, Dec. 1. Kohl’s announced a donation of $375,000 over three years to COA Youth & Family Centers to further the organization’s mission of addressing the critical issues of poverty, education and safety by providing youth the tools and opportunities to reach their full potential.